Minister Pengel, Minister of Health has traveled at the invitation of the Malaria Program at Lawa Tabiki to open a “Health Awareness Week” for the communities of Benzdorp region and the southern settlements garimpeiros Antonio do Brinco and Peruano. The Malaria Program hopes that this activity mainly reach the gold miners active in this area with services and information about malaria, HIV / AIDS, leishmaniasis (busjasi), diabetes and blood pressure. During this period, it is completely free of the different tests, such as to let do indicated. Trop Clinic in Paramaribo can be contacted daily , the clinic of the Malaria Program in collaboration with the Ministry of Health residence at the Anamoestraat 44 above. Everyone can get tested and treated for malaria. Furthermore, there is locally also given advice about HIV, Tuberculosis and Leishmaniasis. Further more blood sugar and blood pressure measurements can all be done free of charge at the Trop Clinic. The aim is for short term and in collaboration with the Medical Mission and the local communities, to establish a permanent clinic in this area. The right location and location of this post will be decided in consultation with the community. Besides Minister Pengel were DNA-member Aida Nading , representatives of the district commissioner present and members of the CCM (Country Coordinating Mechanism). This occasion was also an opportunity to exchange ideas with visitors of the ‘ Health Awareness Week “, as well as some gold mining owners or their representatives. There were discussions included social and health problems in that area. Important issues that were discussed during the sessions were the lack of awareness, about sanitation and structural approach to this problem beyond the absence of rules and provisions for funerals, ambiguities about how to achieve legal residency and training needs for the children. 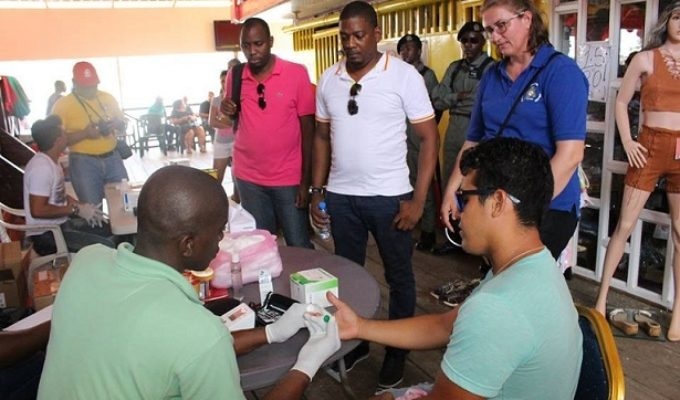 The minister promised to submit the points discussed with the responsible authorities in Paramaribo.